For purposes of this book, the word “ultrasound” will refer to technologically produced, radiation‑emitting sound waves that fall within the electromagnetic frequency bandwidth between 20 kilohertz (kHz) and 4 gigahertz (GHz). Frequencies within this range are generally not audible to adult humans over the age of 25, however they can be heard by many animals and younger humans, and also by babies in the womb. 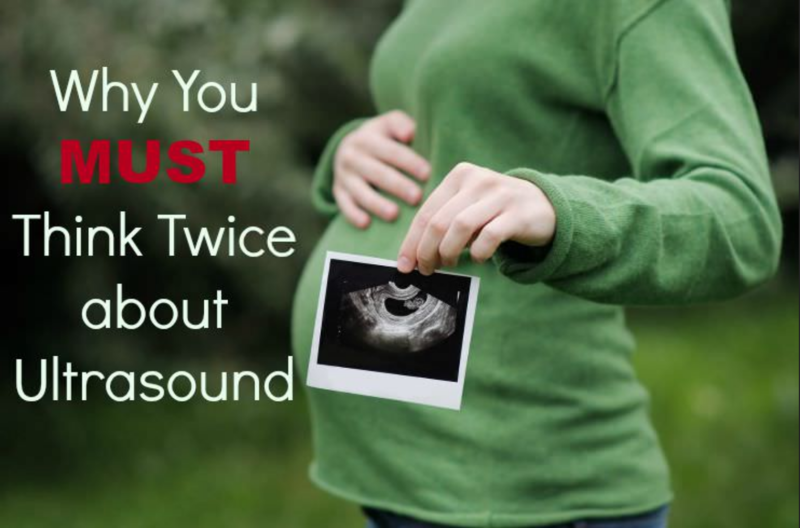 The frequencies used in medical ultrasound are known to be as loud as 100‑120 decibels and, to a baby in the womb, that is akin to standing in a subway station when a train is coming in or standing next to a jackhammer or nearby chainsaw when they are in use. Naturally, the extreme loudness of these frequencies can cause agitation and terror in developing babies and contribute to hearing loss and intrauterine growth retardation, both of which will be discussed in more detail later. What must be stressed now is that babies are hearing and feeling the pressure of these very intense frequencies and there is absolutely no doubt that it is having a detrimental impact on their well-being. We can get a good sense of the impact these artificial ultrasonic frequencies have on living beings by briefly examining their effects on animals in the wild. For example, bats, dolphins, and whales utilize natural ultrasonic frequencies for purposes of navigation, communication, and to locate prey. Like human babies, these animals can hear ultrasonic frequencies that human adults cannot hear and some, like dolphins and whales, have been badly harmed or even killed when the military blasts their mechanically produced ultrasonic (and/or infrasonic) frequencies into the ocean. “Unfortunately for many whales, dolphins and other marine life, the use of underwater sonar (short for sound navigation and ranging) can lead to injury and even death. Sonar systems—first developed by the U.S. Navy to detect enemy submarines — generate slow-rolling sound waves topping out at around 235 decibels; the world’s loudest rock bands top out at only 130. These sound waves can travel for hundreds of miles under water, and can retain an intensity of 140 decibels as far as 300 miles from their source. These rolling walls of noise are no doubt too much for some marine wildlife. While little is known about any direct physiological effects of sonar waves on marine species, evidence shows that whales will swim hundreds of miles, rapidly change their depth (sometime leading to bleeding from the eyes and ears), and even beach themselves to get away from the sounds of sonar. Some of my readers may wonder, as I did, whether military sonar and medical ultrasound are the same, and the answer to the question is yes. However, in addition to frequencies in the ultrasound range, military sonar can also include frequencies in the infrasound range (between 20 kHz down to 0.1Hz). 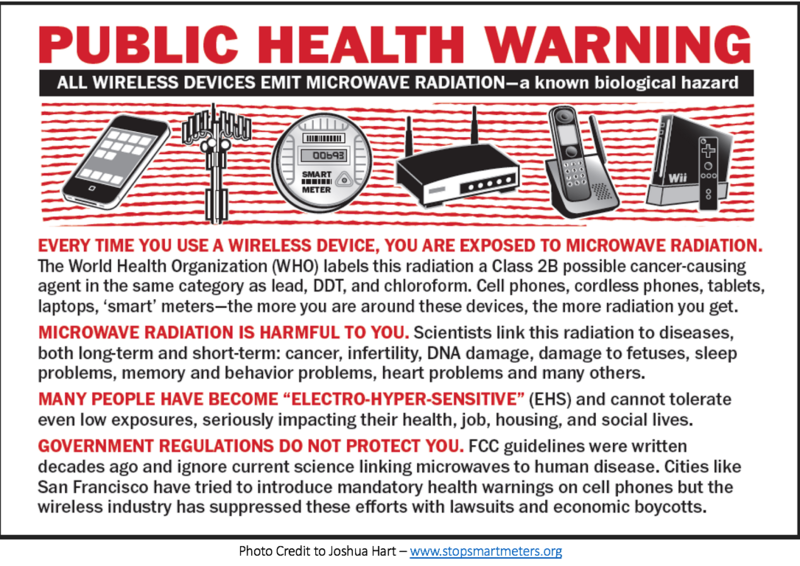 All of these technologically manufactured frequencies can have extremely harmful effects on humans and other life forms and sadly, they are often deployed for this express purpose – i.e., to deliberately cause harm. Despite the destructive capacities of manmade ultrasound being well known, ultrasonic frequencies are nevertheless being deployed in modern obstetrics to “surveil” developing babies (and sometimes murder them) while they are still in the womb. Although the medical establishment likes to promote the idea that the use of ultrasound is totally benign and non‑invasive, in fact, the terms “surveillance” and “monitoring” are inherently invasive and imply an intrusion into a baby’s otherwise private world. 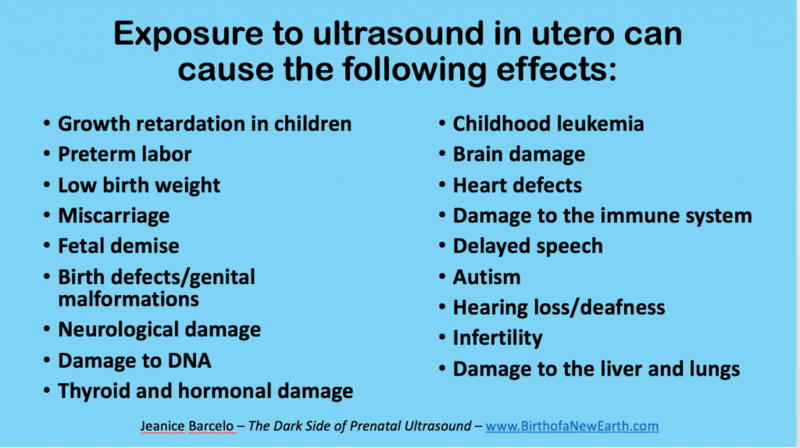 In addition to ultrasound being inherently invasive, there is a plethora of research to indicate that it causes harm. Nevertheless, obstetricians are daily exposing pregnant women to this noxious technology and medical apologists like Wikipedia try to downplay the dangers by suggesting that manmade ultrasound is completely benign and not really distinguishable from normal sound. Despite Wikipedia’s blatant distortions, manmade ultrasonic frequencies are not “normal” as they are not part of organic creation. Instead, they are produced through violent mechanical and electrical attacks against nature (more on this shortly), with effects that can be dangerous and sometimes lethal, which scientists have known for at least 100 years. Moreover, manmade ultrasonic frequencies are many times more intense than the ultrasonic frequencies found in nature. While the human body typically resonates at a frequency between 3 and 30 hertz, medical ultrasound utilizes frequencies in the megahertz (MHz) and/or gigahertz (GHz) range totaling several million or several billion hertz. To keep this in perspective, 1 kilohertz (kHz) equals 1,000 hertz and 1 megahertz equals 1,000,000 hertz. Hence, medical ultrasound typically operates somewhere between one million and twenty million hertz, while the human body is evolutionarily equipped to receive and transmit frequencies of approximately 8‑30 hertz. The Earth herself has a frequency of 7.83 hertz, known as the Schumann Resonance. This frequency is precisely the same as the alpha waves being emitted by the human brain. “Research is showing that being exposed to this frequency is absolutely integral to us. It controls our mental and physical health, it synchronizes our circadian rhythms, and it aids our immune system and improves our sense of wellbeing. The frequencies that humpback whales use to communicate and navigate range from 30 – 8,000 hertz. These frequencies are hugely different from the 1‑20 million hertz that the medical system typically utilizes in obstetrics. Hence, it should not surprise us to learn that, whereas natural ultrasonic frequencies are completely benign and in some cases thought to be immensely beneficial (such as with dolphin-assisted therapy), manmade ultrasonic frequencies are extremely dangerous and repeatedly shown to be harmful and even deadly.